I want to create a 'Welcome.exe' file with the help of following files and a logo in exactly the same way 'LinhHonHuynhDe' had created 'Create DLCD Boot v2.1.exe'. AFAIU, There is no .au3 script file within 'Create DLCD Boot v2.1.exe' . So it's looking that 'LinhHonHuynhDe' had not used AutoIT for it. But I am unable to understand about the procedure which 'LinhHonHuynhDe' had used in order to create 'Create DLCD Boot v2.1.exe'. If anybody know about it then please tell me about the procedure so that I can create 'Welcome.exe' . It is a RAR SFX. In the directive settings the file to be run on execution is "Run.bat". Q. 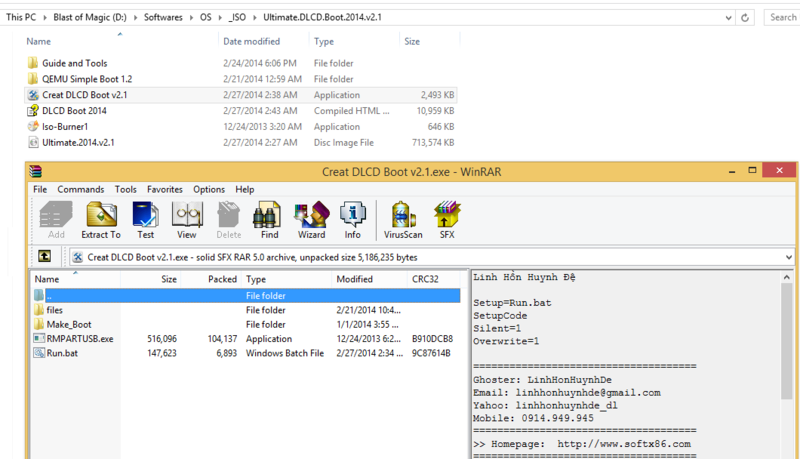 WHAT file will be executed when the Create DLCD Boot v2.1.exe is run? Assign yourself 10 points if you replied A1, and -2389786 points if you chose any other answer. Is it possible to add a logo within .exe file created by 'RAR SFX' or '7-zip SFX' method ? If 'Yes', then HOW ? Actually currently I am using a self-extracting archive (Welcome.exe) created with the help of 7-zip. But it doesn't allow me to use logo. It's why I want something different method in order to create 'Welcome.exe'. Should I have to rename 'Restore_PTN.cmd' to 'Restore_PTN.bat' ? And what would you expect that would change? Maybe renaming the file to CoolLogo.xyz would help? Maybe it would be more effective to use as an installer an actual installer (that allows a graphical splash screen), what about NSIS? Even if you are not (strictly speaking) installing anything, an installer is essentially a SFX with a script language. What you want to display is most probably not a "logo", but rather a "splash screen". Actually for me MOTO of using a LOGO within 'Welcome.exe' is to make it different and beautiful compare to other normal .exe files because I have to use 'Welcome.exe' in many places all over my 'SMART USB'. Your are right, CMD console is not too much attractive. It will be amazing for me if I would success in creating a "splash screen" based 'Welcome.exe'. I think I have to learn about the basic script writing in order to create slightly advanced .exe files. May be it would take some time to learn about script writing. So for now I will prefer to create a logo based 'Welcome.exe' similar to 'Create DLCD Boot v2.1.exe'. After that I will try to learn some more advance .methods. So what method/tutorial should I try in order to create a logo based self-extracting archive (Welcome.exe) ?